One of the simplest and tastiest potato items to make is Zeera Aloo Matar. As a child I loved this preparation because it was tasty and not spicy, which appealed to my tiny taste buds, and now as an adult I love it all the more because my son loves it, and i can make it in a jiffy. It is interesting how aloo or potatoes became an inseparable part of Indian cuisine. Potatoes were introduced in India during the Moghul rule, in the 17th century. It took little time for us to use this versatile vegetable in several of our preparations. Potato is a vital ingredients in several foods across India. They blend easily with other ingredients of the dish and add taste value in both vegetarian and non vegetarian dishes. Potatoes are not just used for cooking, Potato skins along with honey are a folk remedy for burns in India. Several burn centers have experimented with this remedy to protect the burns while healing. Aloo is a South Asian term for potatoes. It is a versatile vegetable and is cooked along with several green vegetable and meats. The Aloo, or potato was first domesticated in the region of modern-day southern Peru and extreme northwestern Bolivia between 8000 and 5000 BC.It has since spread around the world and become a staple crop in many countries. If you find that the gravy you have prepared has extra salt, cut a raw potato in two or three and let it boil with the gravy for a while. The potato will absorb the extra salt and can be later removed from the gravy without any change of taste to it. Slice the potatoes in thin wedges, wash with salt water and keep. Tip in the cut potatoes, add salt to taste, reduce the heat to minimum and cover the pan. Keep stirring the potatoes while they are being cooked so that they don't stick to the bottom of the pan. After the potatoes are half done, add fresh green peas. Remove the pan from stove after potatoes and green peas are cooked. Potatoes should get a little crispy by now. Remove on a plate and serve hot. 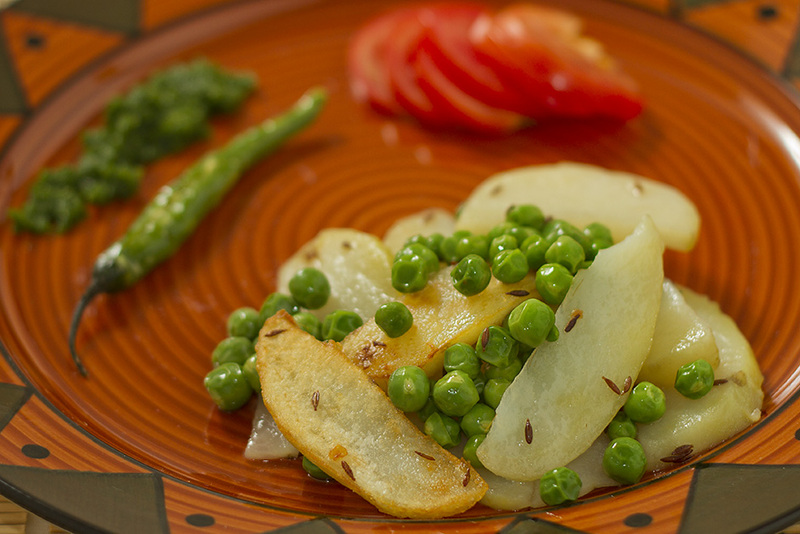 Serve these crisp potatoes with tomato slices, green chutney and hot parathas.